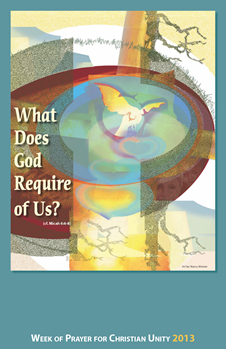 During the Week of Prayer for Christian Unity we are invited to enter more deeply into our faith and to ask the question what does God require of us? The biblical readings, commentaries, prayers and questions for reflection, all explore different aspects of what this means for the lives of Christians and their unity with one another, in and for today’s world. These questions are provided as further opportunities to reflect upon the daily themes. Where do we practice true conversation, across the various differences that separate us? Is our conversation orientated towards some grand project of our own, or towards new life which brings hope of resurrection? What people do we converse with, and who is not included in our conversations? Why? In light of that prophetic tradition in which God desires justice, rather than ritual without righteousness, we need to ask: how is the Eucharist, the mystery of Christ’s brokenness and new life, celebrated in all the places where we walk? What might we do, as Christians together, better to witness to our unity in Christ in places of brokenness and marginality? Are there times, even in our own Christian communities, when the prejudices and judgments of the world, - with regard to caste, age, gender, race, educational background - stop us seeing each other clearly in the light of God’s glory? What small, practical steps can we take, as Christians together, towards the freedom of the Children of God (Romans 8.21) for our churches, and for wider society? Today’s readings invite Christians into a deep unity of action in common concern for the earth. Where do we practice the spirit of the year of Jubilee in our life as Christians together? Where, in our Christian communities, are we complicit with things that degrade and exploit the earth? Where can we work more together in learning and teaching reverence for God’s creation? Who are those in your communities whom Christ calls into your friendship? What prevents the friends of Jesus from being friends with one another? What are the barriers that separate Christians in your community? What are the barriers that separate Christians from other religious traditions in your community? What are the differences and similarities between walking beyond the barriers that separate Christians from one another, and walking beyond those between Christianity and other religions? Who in your community stands in need of the solidarity of the Christian community? What churches are, or have been in solidarity with you? In what ways would more visible Christian unity enhance the Church’s solidarity with those who stand in need of justice and kindness in your context? What are the struggles towards justice in your community? What are the causes for celebration on the way? What are the struggles towards Christian unity in your community? What are the causes for celebration along the way?